If I were to name my 'trouble spots', it would be, like many women, my thighs, hips and triceps. This is because I tend to be 'Estrogen Dominant' - meaning my body both produces a lot of estrogen, and my estrogen levels are higher than those of my other hormones. Estrogen dominance does not effect just women however, and it can have more serious effects than just some extra pounds, it can negatively effect your mood, fertility and in some more serious cases increase cancer risk. Now thats not to say all estrogen in the body is bad, just like our other hormones balance is key, and optimum estrogen levels play a big part in fertility, bone health and exercise recovery. If you have read any of my previous articles, or attended any of my events, you will know that I believe great gut health is one of the foundations of health, and it is something that everyone should be looking to improve. Poor gut health can inhibit estrogen metabolism and detoxification by stopping the body fully eliminating excess estrogen. Some simple ways to improve gut health are eliminating trigger foods such as wheat and gluten, adding in some great fiber rich foods, and adding a probiotic supplement to your daily diet. My favorite is the Poliquin Proflora Excellence. I'm a huge believer in getting up to 9 servings a day of fiber rich veggies, and adding in cruciferous varieties such as broccoli and kale can have a double whammy effect on that pesky cellulite. The fiber in the veggies can help with estrogen metabolism and detoxification, and a compound called DIM (Diindolylmethane) can help aid the detoxification pathways that deal with estrogen metabolism. My Alkalizing Green Soup is a great way to add in more cruciferous veggies at this time of year, and is nourishing, delicious and super economical to make! 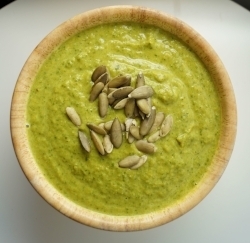 Click here for my Alkalizing Green Soup Recipe! There is a reason most of my training programs contain a lot of glute, hamstring and tricep exercises; these are the areas that most women tell me that they want to improve. By building muscle in these areas it improves the shape and appearance of the trouble spots, and in the case of the glute and hamstrings, focusses on muscle groups that burn a lot of calories, therefore aiding fat loss throughout the body. Deadlifts and all of their variations are among my favorite glute and hamstring shapers, and below is a short guide deadlift technique. Stand super close to the bar (it should be touching your shins), with your feet about hip distance apart, facing forward. Hinge forward from the hips (as if you were bowing) and grip the bar firmly, with your hands a little wider than shoulder width apart, knees will have a soft flexion, but not a bend. Squeeze your shoulder blades together, hold your core tight, and you should feel tension in your upper back, triceps and abs. Keeping this firm grip and tension throughout the body stand up straight - the bar should come up with you and will stay close to the body. To lower, again hinge from the hips, keeping the back straight and torso lifted, and slowly bring the bar to the floor.